In many homes the tub/shower is closed off by a curtain on a rod. It is true that shower curtains are quite attractive and can add color and design to an otherwise drab bathroom. Even so, many people prefer a sliding glass door. Since the cost of adding the door is rela­tively inexpensive (usually between $150 and $500, depending on the quality and the design, if any, etched into the glass), and since installation is relatively easy, it’s become a favorite beginner’s reno­vation project. 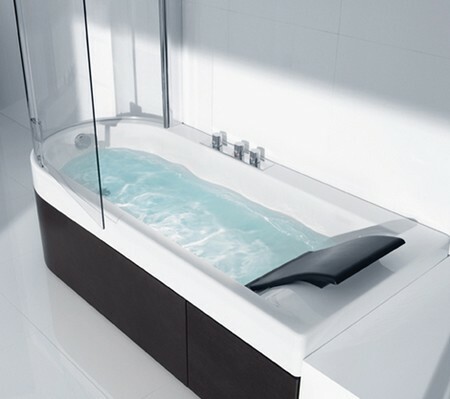 Tub/shower doors are readily available from building supply companies. Be aware, however, that almost all ready-made doors are designed for a 5-foot tub. If the area you have is larger or smaller, as may be the case in a custom design, you’ll have to get a custom-made glass door, and the cost can be quite high. The model you get should be appropriate to the house you are remodeling. For example, if you are working on a moderately priced home that has chrome bathroom trim, you will probably want a modestly priced chrome stall door. The trend in upscale homes is to have neither a show­er curtain nor a door on a tub/shower combo, but rather to have a drain area around the tub sufficiently large that no containment of the spray is necessary. Such a solution, of course, requires a lot of bathroom space. A tub/shower door is easy to install. It can be done in an hour or two, even by an inexperienced worker. Assuming that the door frame is the correct size, all that’s required is to mark and drill sev­eral holes into the side walls. Since these walls are frequently tile, a special ceramic cutting drill is used, with plastic fillers added to secure the screws. The bottom is held in position by the side brack­ets, which are then screwed into place, with caulk being used to give a watertight fit. The top can then be placed on the side pieces and the doors easily hung. Be careful when you drill the holes for the brackets; you don’t want to crack the tile. Be sure that the grout placed under the bottom sill forms a good seal to prevent water from leaking out. And be sure that the bottom sill is correctly placed—the little holes face inward so water col­lecting in the grooves will run back into the tub/shower. Finish off with a thin bead of caulk along the inside and outside edges of the sill. To smooth the caulk, wet your finger with water and then run it along the bead. The caulk will smooth out for a professional look. Use a helper to lift the glass doors, which can be heavy. Usually they will require some adjustment at the top to make them level.